The Destructor – sounds like a character Schwarzenegger might play. Nothing so exciting. Merely our waste management facility, on Foss Islands Road, in the early 20th century. 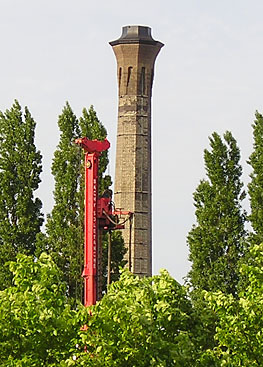 An incinerator, used for the destruction of household rubbish. It also provided power. 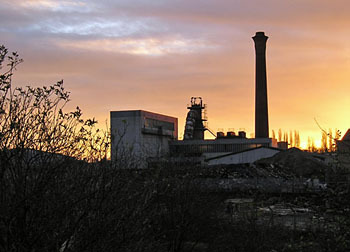 All that’s left of the facility is its chimney, its Destructor days forgotten. It’s now known to many as ‘Morrisons Chimney’, perhaps giving the erroneous impression that the supermarket recently built alongside incorporates a very large fireplace. There are many references to the Destructor in the council minutes of the late 1890s and into the early years of the 20th century. In spring and summer 1900 the minutes record the concern over delays in its construction. In November 1900 a report from the Electric Lighting Committee discusses utilising the facility: ‘The Electrical Department to pay for the steam from the Destructor’. It didn’t take long for potential problems to come to light. Concerns were expressed over the build-up of refuse on the platform. It was noted that this was inevitable and happened at all Destructors. In January 1902 the City Engineer reported that an extension of use of the Destructor was to be expected. House refuse during 1896 was 118 loads per week, but had grown to 180 loads. The weight of these loads had increased from 14cwt to 1 ton. Also needing consideration was the refuse from ashpits. I’m not sure when we stopped burning rubbish in the Destructor. I vaguely remember remnants of other buildings when the site was still the council tip, pre-Morrisons. 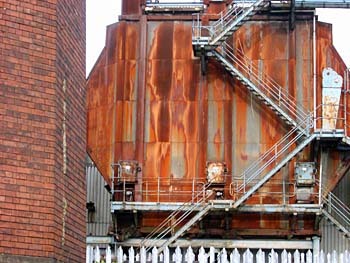 Peter Burgess sent me this photo, some years ago, of the rusty loveliness of part of the old facility – the chimney’s base is on the left of the picture. And of course I’m mentioning this rather mundane matter of rubbish disposal because today councillors in North Yorkshire have voted to go ahead with the Allerton Park incinerator, located alongside the A1(M), not far from York. We’ve gone back to burning rubbish, though apparently it’s done in a more environmentally friendly fashion, and we stick the Destructors outside our cities, where fewer people can see them. Perhaps we should stop buying so much stuff, throwing it away so often and buying even more. Then perhaps we wouldn’t be piling great mounds of rubbish into landfill and perhaps we wouldn’t need to revisit the Destructor idea. Pathway surfacing techniques have moved on in the last hundred years, at least, so we won’t need its ashes to surface Cinder Lane. By Lisa @YorkStories • 30 October 2012 Histories To link to this page's proper location please use the > permalink. A certain amount of “Stuff”is necessary to get by,it’s the packaging that grates on the nerves a little.Wartime shopping involved no factory wrappings,one took along treasured stiff paper carriers ,with string handles,and hoarded paper bags/newspaper, for the shop to put purchases in,altogether a very satisfactory economic solution to WW2 shopping problem and shortages.I doubt the present climate would encourage such economic measures,not forgetting silly sell by dates,encouraging over consumption and waste.Most wartime pantries had tinned stuff hoarded for 4/5 years without killing people whe eventually consumed them!